Home > Safety Signs > Hazard Warning Signs > Machine Hazard Signs > Entanglement warning symbol label. Belt drive warning symbol label. Caution Belt drive hazard symbol and text safety sign. Caution Entanglement hazard symbol and text safety sign. Entanglement hazard symbol safety sign. Safety labels. 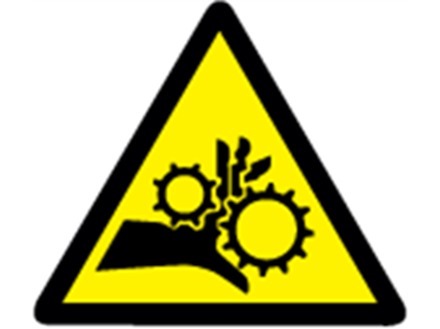 Entanglement hazard warning symbol label. Part of our warning safety label range, to warn of risks and dangers of injuries from entanglement when operating equipment. Triangular labels available in 3 sizes, 15mm, 25mm and 50mm. Supplied in packs of 100 labels. Waterproof, chemical (oil and solvent) and scratch resistant. Hazard warning safety labels. 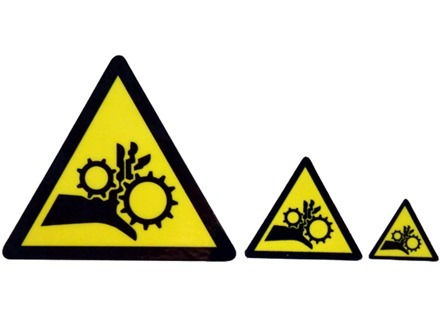 Entanglement hazard warning symbol label, complying with ISO EN 7010 and Safety Signs and Signals Regulations 1996. Supplied in packs of 100 labels. RoHS compliant. RWL121 Size 15mm triangle. Material self adhesive vinyl, with clear laminate. RWL221 Size 25mm triangle. Material self adhesive vinyl, with clear laminate. RWL321 Size 50mm triangle. Material self adhesive vinyl, with clear laminate.